Achieve a magical cleansing routine with The Konjac Sponge Company Mythical Mermaid Konjac Sponge Box and Hook in Red Clay. 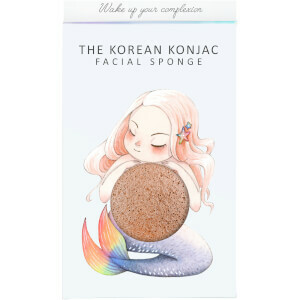 Like all award-winning Konjac Sponges, it has been hand made with plant fibre in the volcanic hills of Jeju Island, South Korea, and is 100% natural and biodegradable. Gently cleansing and exfoliating, the skincare tool uses French Red Clay to stimulate blood circulation, creating a healthy and radiant glow and balancing uneven skin tones. The sponge also helps to reduce the appearance of wrinkles and sweep away dead cells to reveal the newer, brighter skin beneath. Expect illuminated results. The sponge comes with a detachable suction cup decorated with a mythical mermaid.